A huge portion of the state’s workforce is ineligible for unemployment insurance benefits, even though their wages are taxed. Overall, only one-third of workers who are unemployed in the state actually receive benefits. 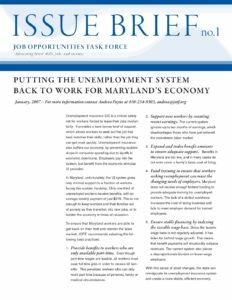 In a new issue brief, Putting the Unemployment System Back to Work for Maryland’s Economy, the Job Opportunities Task Force makes five recommendations that will help the UI system better serve workers, employers, and the state economy.